We are an enthusiastic team who likes to solve the problems and make the lives easier for our users. We are very passionate about the Ads and its effects on the publisher’s behaviors, we feel like there’s a lot of innovation and contribution we can do for the end user in Ads niche. Our aim is to build the #1 Ad solution in the world and we have a roadmap for it as well. What is Ads for WP? 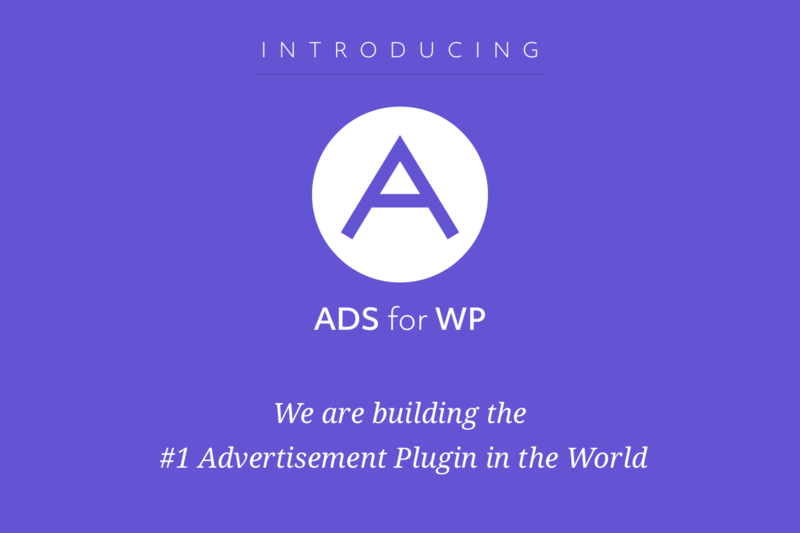 Today, I’m excited to present you “Ads for WP“, an opensource and free Ads plugin available for the WordPress community. We plan to make it the best Ad solution in the market and we won’t stop until it’s built. Let’s have a look at the features of the plugin! We have designed the user experience in a way that it is extremely easy to add an advertisement. There are no clunky options or selections that you have to go through, just plain and simple ad management. We will be making it very advanced but the user experience will always be our first priority! We have made sure that the plugin is lightweight so that it doesn’t put a lot of the pressure on the server. We are making performance our priority since the beginning. AMP has been integrated into the core by default. Any ad that you create, will generate a valid AMP compatible output right out of the box. We will support all the AMP plugins and extensions by default. Currently, we have Google Adsense and Media.net integrated within the plugin, we are planning to add all the Advertisement companies. We will be adding more and more ad companies integration as we go ahead. If you are using an Ad company which is not a part of our options, then do let us know by contacting us and we will add their integration for you. We will be offering a great support for each and every free user. Every single bug or feature request will be taken seriously. We don’t care if it takes us weeks or months, we will solve each and every problem to make sure that we are able to help with the issues. We will keep the feedback loop tight and communicate all the feedback with the development team. We are constantly developing the plugin and our aim is to make it the best AD solution in the world. We have a development roadmap for the plugin. Display Conditions: A way to show/hide ads individually on based on posts, pages, taxonomies, custom post types, device, location, cookie, parameter, etc. Visitor Conditions: Find out if the user is coming from a Device, Website, date, a URL, location, language, Parameter, User Agent and many more. Reports / Stats: View the detailed statistics of the Ad reports and earnings right from your dashboard. A/B Testing: Find out which ads perform the most and how you can improve the ad revenue further. GDPR & Privacy tools: We have got the GDPR and other privacy tools planned so that you don’t have to worry about complying with privacy laws. Click Fraud Protection: Helps you fight the click fraud and helps you stabilize the ad revenue. Responsive Ads: We will be adding the responsive support to Ads to give the best viewability to ads on devices. Ad Group: You can assign multiple ads to one group and give them a specific condition. Ad Blocker: Help you fight Ad blocker users and help you improve monetization. Innovation & Disruption: We are constantly evolving our product and going to introduce new features which are not being used by anyone in the world. How to Download Ads for WP? You can download the plugin from the official WordPress.org Ads for WP repository. How to Report Bugs and Features? You can help us improve the plugin by reporting the issues and suggesting new features, you must create a new ticket in the Github Repository. If you are a developer or a WordPress webmaster, we would love your pull request to our Github repository. We have the whole development and support team available live on the Telegram group. Did you like the plugin? Share your review! If you liked the plugin, then please share your review here.